The past couple of weeks have been glorious here in the UK. Sunshine nearly everyday, above average temperatures and loads of time to get out & about in the garden. Spring has to be one of the most magical times, everything is bursting back into life. 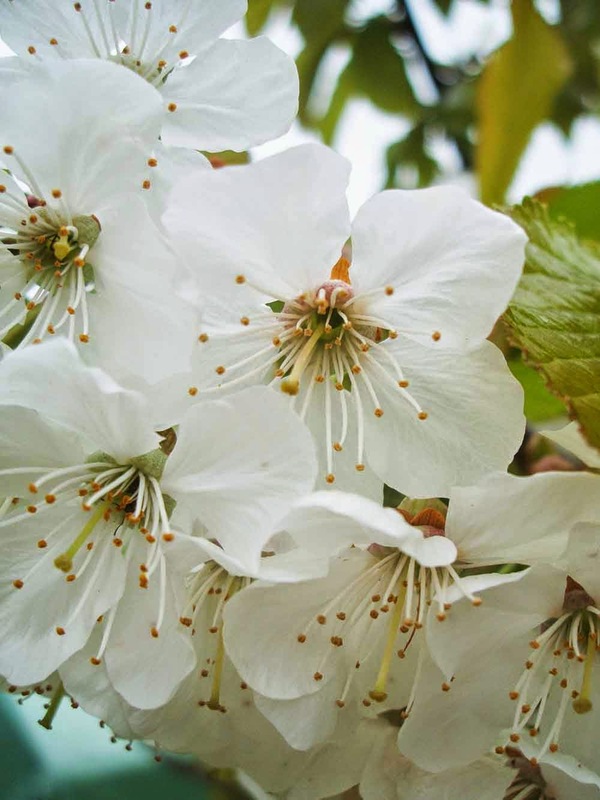 I adore seeing the blossom arrive on the trees and planning the seeds I'm going to plant. I've been planting out calendula, nasturtium and some other 'purple flower' I grew last year. The calendula came out of packet of mixed seeds last year & I fell in love with them. With regular dead-heading, they flowered all Summer long. 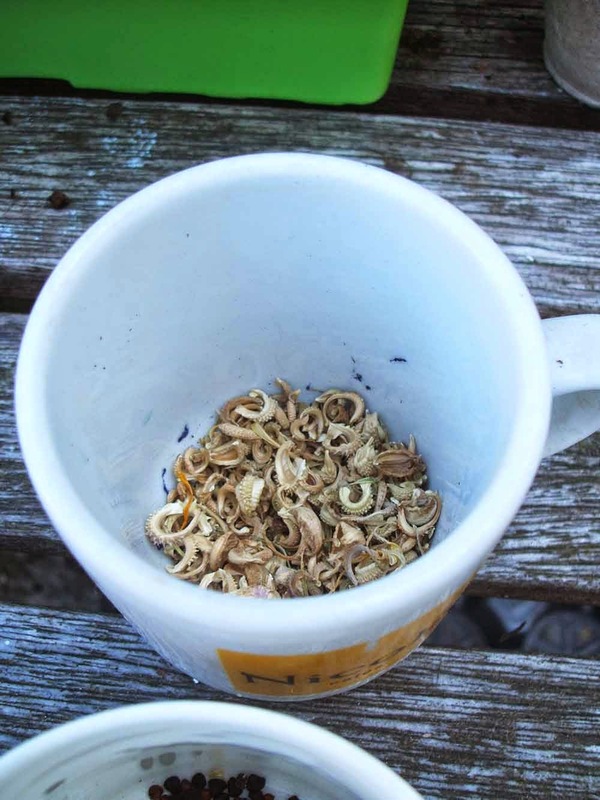 I saved a heap of seeds from last year's plants & they've been drying in a cup all through the Winter. Our apple tree was really unhappy last year. It didn't fruit at all & the leaves turned brown. I gave the tree a prune for the first time & so far, it looks much happier this year. It's starting to bud with blossom and the leaves look much better. I also love nasturtium. I'm a big fan of easy plants that look after themselves and churn out heaps of flowers. 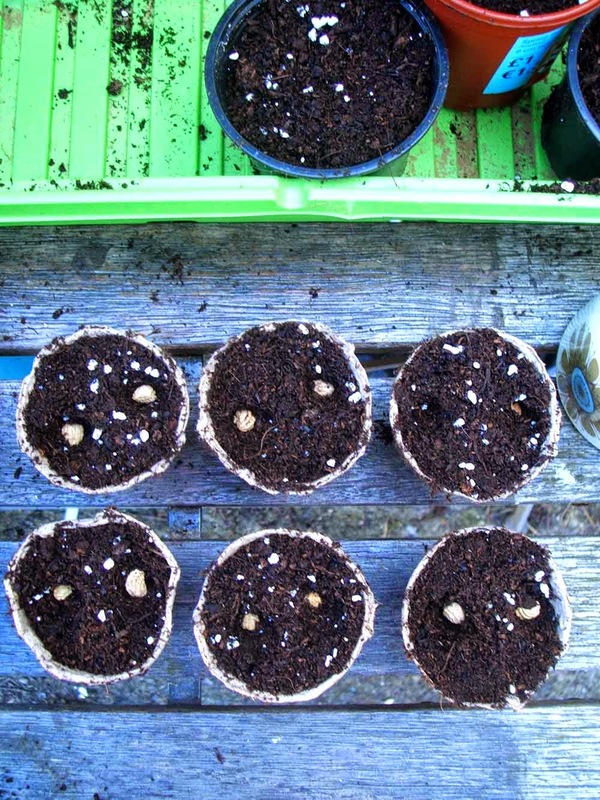 I've planted a couple of seeds per fibre pot. 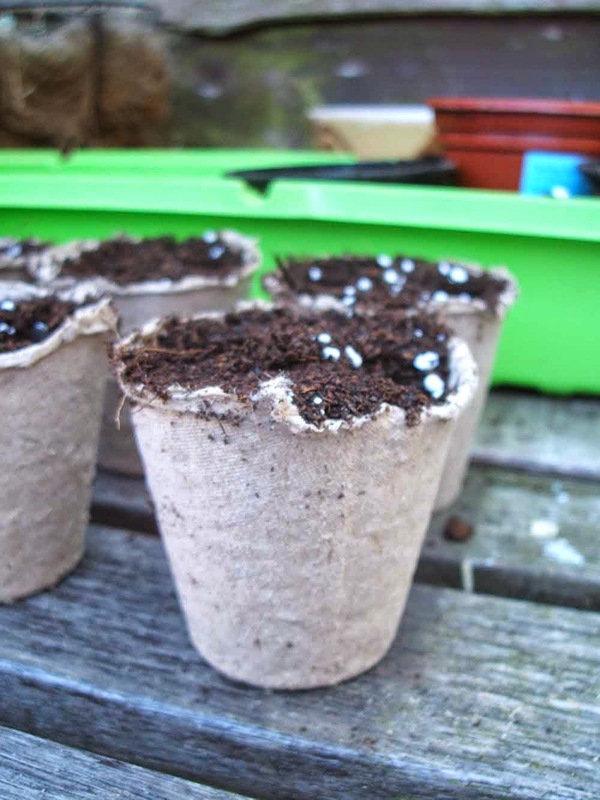 The good thing about fibre pots is you can put them into the ground & not disturb the seedlings roots. I bought mine from Wilko, they are only 80 pence for 12 so definitely worth buying a few for your seedlings. 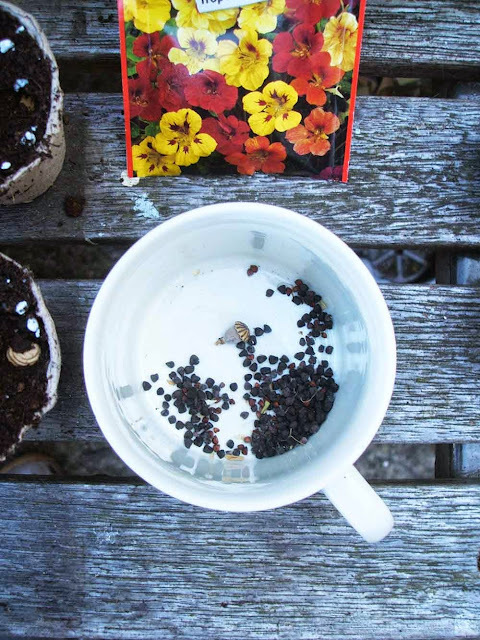 I also go around pushing nasturtium seeds in here & there around the garden & wait to see what pops up later in the Summer. 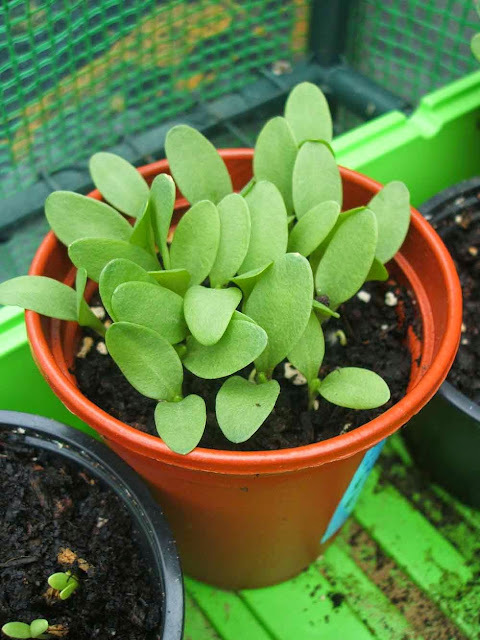 The unidentified 'purple flower' has already started to sprout & I will need to pot them on soon. They also came out of the packet of mixed seeds last year & once again I saved lots of seedpods from the plants & dried them over the Winter. I think possibly one of the best Spring-time treats is seeing the cherry blossom appear. It's so fleeting, gone after a few days, but it is utterly beautiful whilst it is around. 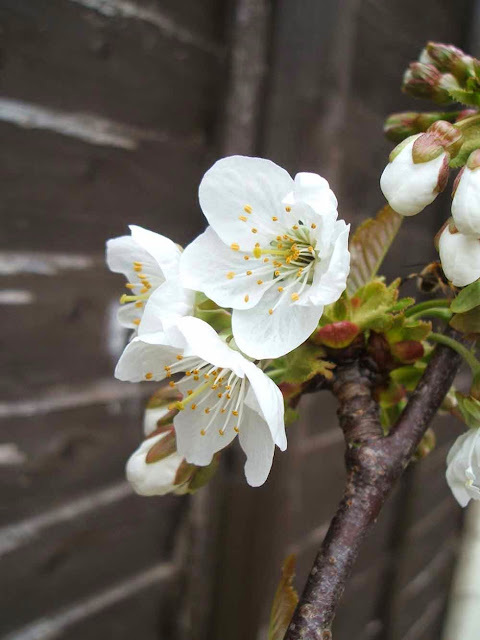 We have two cherry trees, so I get to see plenty of my favourite blossom. Ah cherry blossom gets me every year, reminds me of being a child and walking up the school drive which was lined with those trees either side. Happy memories. I'm only planting a few things from seed this year, we did a HDYGG seed swap a few weeks back and I received some seeds from the States so I'm most excited to see what grows! Thanks for the heads up about the peat pots - they sound like just what I need! Can't wait to see what the seeds from the USA look like Mammasaurus! the cherry blossom looks lovely, is it scented? I love the magic of Spring. We've had perfect weather conditions for growing recently and everything has come alive. It's such a shame cherry blossom doesn't last longer as it is so beautiful! I had to go out into the garden & check if Cherry Blossom was scented! 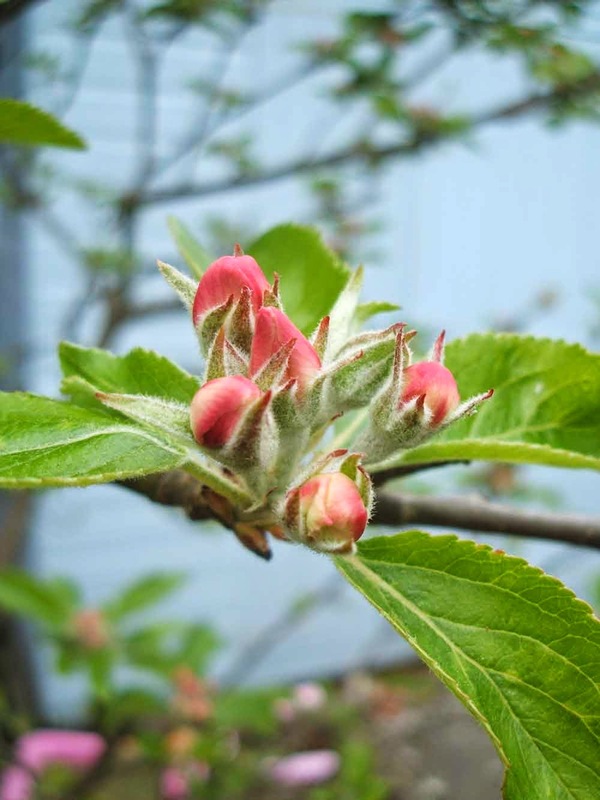 The trees I have aren't scented, but the apple blossom has a lovely, subtle scent.